What? 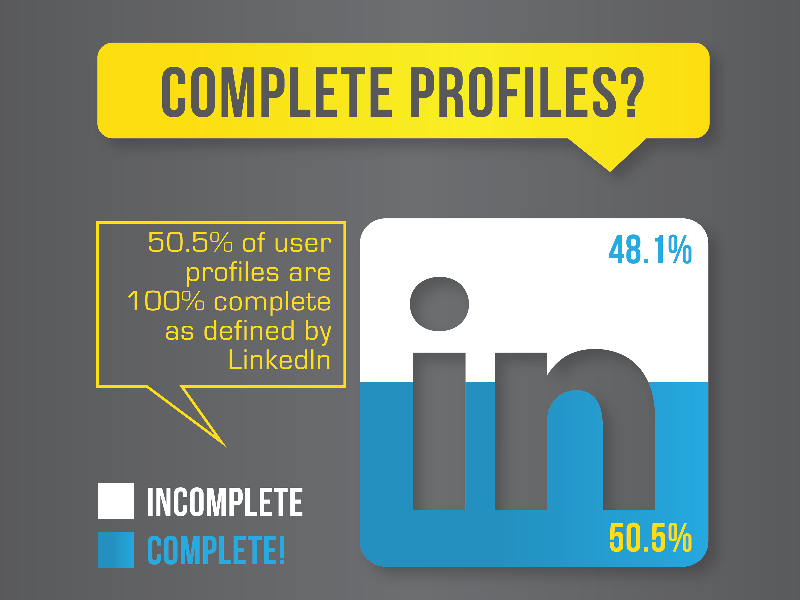 Do you still have a patchy, half-completed profile In LinkedIn? Did you know that LinkedIn has now become the most important tool for recruitment? Survey shows that about 79% of recruiters are using LinkedIn as their recruitment tool. Here are reasons why you need to have a polished LinkedIn profile, pronto! Search Engine Optimization (SEO) works wonders with LinkedIn. If people search you by your name, your LinkedIn profile will show up in the first or second page in Google. Go on try it! Simply type your name in the Google search bar and see the results for yourself. Your LinkedIn profile appears in the first or second page, right? Study shows more than 94% of clicks come from the first page of the search result. How many times have you searched the 2nd or 3rd result page in Google? Perhaps never or maybe on that rare occasion when curiosity got the better of you, so you glossed over the second page as well. So, try to build a strategic LinkedIn profile incorporating keywords that increase the visibility of your profile. If you do so, chances of your profile getting viewed by recruiters increases, as it shows up higher in the search. However, for that you need to have an updated profile in LinkedIn. With 300 million members worldwide, LinkedIn has a wide member base around the globe. Isn’t that something? Imagine the immense opportunity! You will be able to reach this amazing number if you have an account in LinkedIn. It’s a perfect platform to meet new people online. In fact, it gives you ample scope to get to know more and more people each day, thus increasing your network. You will be able to get all the latest updates and happenings around you. You can also join groups or communities to expand your network base. Executives from every Fortune 500 company have their profiles in LinkedIn, making it the most professional networking site on the Internet. All the organizations, be it an MNC, art organizations, NGOs, any institution, you name it and they are all there on LinkedIn. If you have an updated profile in LinkedIn, all the top executives will be able to access it there. Moreover, you will receive all the updates on what’s happening on the professional front in those organizations. You can keep the companies you want to work with in the future on your radar through LinkedIn. Wondering how? Simply start following them. You will get all the latest updates of the companies – when they are hiring, latest technologies, social events, seminars, webinars, conferences, workshops and what not! Want this information made accessible to your connections? It’s easy. Just update your status regularly and your connections will know what’s happening in your world in a jiffy. One never-fail method to make yourself noticeable and get recruiters to identify you is by taking part in discussions. You can add your insightful ideas during these discussions. However, you need to make sure that you converse intelligibly and unveil your expertise sophisticatedly. You should not project yourself as brash or a know-it-all kind of person. Be careful what you convey on these discussion forums and try to make a positive impression in the minds of the recruiters. So think out of the box, be innovative and be the leader of ideas in LinkedIn. Here is where LinkedIn wins over other social media sites. It’s a platform where other people can vouch for your skills and expertise. Your teammates, colleagues, managers can endorse you professionally by adding brief testimonials or recommendations on your page, showcasing your talent. In the same way, you in turn can also endorse your teammates and colleagues on this platform that will give their careers a boost as well. How does it help? Well, it simply increases the search engine optimization. So, now that you are well versed with how LinkedIn helps you, what are you waiting for? Update your profile and see the change it brings about. Meanwhile, don’t forget to comment on this article in LinkedIn! We value your precious thoughts! Connect and like us on Twitter, Google+ and Facebook. Visit our website at www.medialabs.in to know more.